Click the Water Levels link above to see the current dam generation waterflow reports for Bull Shoals and Norfork Lake tailwaters. Remember our water levels change daily and any fluctuations are always first initiated by a loud siren that can sometimes be heard from our Resort river frontage, but down river its tougher to hear. Please be careful and constantly check for rising water levels when your fishing down river of our resort. If you want a hard crust pour butter on top, then cook. Good with all kinds of meals. Guide and owner Ryan McDonald gives this 5 stars! •	Pour 1st beer in with dry mix. Then open other beer and drink it. •	Open 2 bud lights. Drink 1 and pour other into big bowl. •	Deep fry or frying pan, bout 375 degrees or really hot pan. 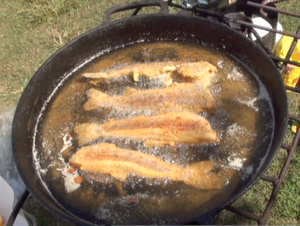 Fry till the fish float .or golden brown. · Smoke till shrimp turn pink….do notovercook!